Teaching is a difficult profession, period. It takes a tremendous amount of energy to keep our students engaged. The challenge is amplified for teachers working in our lowest performing schools and educating our most underserved kids. The same schools struggle to attract and keep teachers. The nationwide teacher shortage has been a hot topic in the media, and, for some Bay Area cities, the crisis around attracting and retaining teachers is heightened by increasing housing prices. 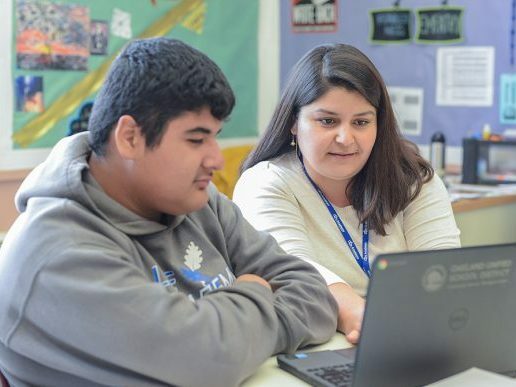 A recent article noted that Oakland’s struggle to retain teachers is growing as the number of teachers graduating from teacher preparation programs is rapidly declining. Some Oakland communities face greater challenges to attract and retain teachers. In those communities, the shortage is even worse where the demands on teachers are even higher and the resources fewer. Students attending schools in the West and East regions of Oakland have the lowest teacher retention rates in the city, losing on average 28 and 27 percent, respectively, of their teachers every year from 2010-2014. 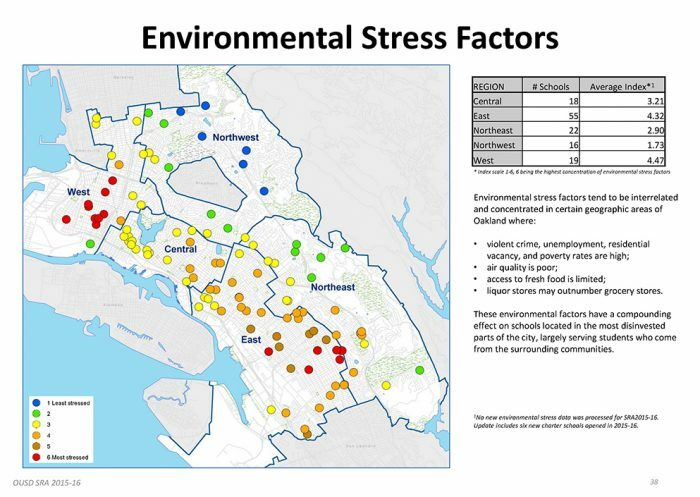 Oakland Unified School District (OUSD) recently released city-wide data about schools that includes “environmental stress factors” that students face. Some of the environmental stress factors are violent crime, unemployment, air-quality, access to fresh food, etc. The data is clear: communities like West Oakland and East Oakland face more stress factors than others. Teachers in these communities find themselves being more than teachers. They become case managers and have little support for these additional responsibilities. The teacher turnover rates in these communities are some of the highest in the city. These same schools lack the additional resources that some of their better off counterparts are able to raise each year. The disproportionate funding sources and revenue streams contribute to concentrated shortages in some neighborhoods and schools. Many of Oakland’s Parent Teacher Associations (PTAs) are responsible for fundraising significant sums of money for their schools. In fact, there are several PTAs that raise hundreds of thousands of dollars to supplement school budgets, with some collecting as much as $600,000 per year. Some schools also receive private philanthropy to augment their funding stream. Most schools rely on $8,000 per pupil for their budget and we have found some schools with a total income that brought their per pupil spending to $11,000. So as we take a moment to acknowledge and celebrate teacher appreciation month, let’s make sure we send an extra special thanks to our teachers working in communities with few resources. These teachers work miracles with little support and resources.